It's time to take your cafe-hopping experience to a whole new level. With the highly concentrated food scene in Singapore, a new breed of dining experience has just come on board — Bistros. The Rustic Bistro is not only wallet-friendly, but also provides the perfect ambience for large groups and families. They also feature great-tasting food that your tastebuds deserve. Less than 4-months old, the humble bistro is dedicated to learning and crafting menu items to suit the diverse tastebuds of Singaporeans. Dining with your buddies is made exceptionally simple WITHOUT the hassle of calculating +10% service charge and +7% GST. Hooray! Their colourful furniture reflects their pride in creativity and going against convention. While the colours don't seem to complement each other, the contrasting effects appear to work. The ambience may not be as enchanting as that at Carpenter and Cook, but it has its own mystical character. I can't quite put my finger on what it is though. Wires and lightbulbs hang loosely overhead as an additional decorative feature, setting the mood of the Bistro. The chefs are definitely the 'Thomas Edison(s)' of Modern-inspired Western cuisine, because any lightbulb moment could lead to Point #4. Occasionally, you may get FREE appetisers from the Rustic Bistro Chefs. This is sparked by their random innovation, according to which they 'make anything when it comes to their mind'. They then get feedback from their customers, and think about putting it on the next menu. 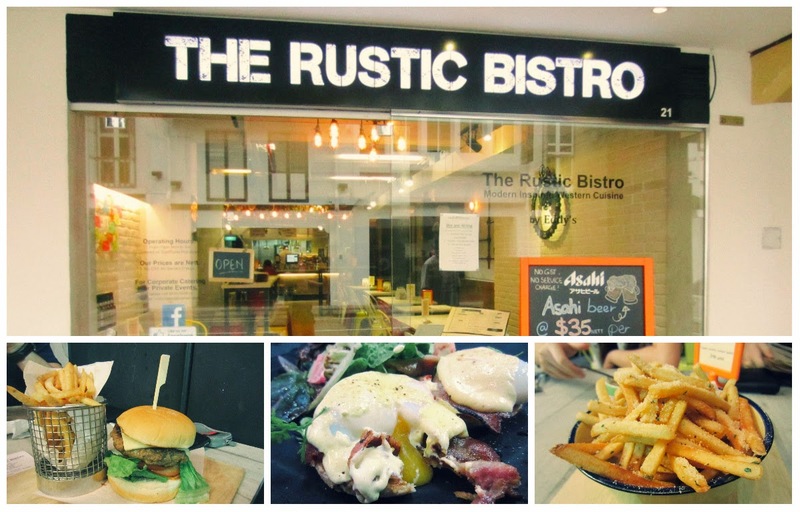 Because Rustic Bistro is a totally new concept, they are open to changing their menu to suit the tastebuds of their customers. The appetiser I tried tasted like Cordon Bleu with grape juice extract and the flavours were harmonious. One of the MUST-TRY items on their menu is the Rustic 3-Way Eggs - S$14.90. I recall this as one of the challenges on MasterChef, in which the contestants had to create various versions of eggs. The Rustic 3-Way Eggs consist of Eggs Benedict with Bacon & Burnt Hollandaise, Scrambled egg on toast with smoked salmon and a sunny side-up on toast with tomatoes. For only S$11.00, try their Eggs Benedict! It is definitely one of the cheapest in town (and the most delicious too). With bacon, burnt hollandaise and mixed mesclun, this protein-rich food would appeal to bodybuilders after a workout. Play the video and see how the egg yolk slowly oozes out. The texture was thick yet smooth and velvety, with the hollandaise sauce a great compliment to each bite. No editing software was used! I always love my eggs with slices of smoked salmon. For only S$13.00, the Eggs Florentine features poached eggs resting on top of smoked salmon, with pieces of spinach and a dollop of burnt hollandaise enveloping the dish. It may look small, but it's actually quite satisfying. Try their Pesto Chicken for S$11.90! It was initially overwhelming with the strong, rich flavours engulfing my tongue. I always thought that this sort of pasta is mild-tasting. Don't feel shy making loud slurping noises with this spaghetti tossed with basil and chicken! For only S$5.00, you get a large bowl of truffle fries topped with powdered parmesan cheese. The fries are cooked fresh, so you don't have to worry about them turning soggy! The portion was large enough to be shared amongst four people, so it's a real steal from The Rustic Bistro. The only downside is that they tasted too salty for me, so do let the chefs know beforehand if you don't want too much salt in it. Marination is extremely important for flavourful Fish & Chips, and Rustic Bistro offers a great-tasting version for only S$10.90. I would appreciate that they serve it on a plate instead of a chopping board though, as it's rather difficult to contain the crispy breadcrumbs within the wooden board. The Rustic Beef Burger - S$11.90 is for big eaters. The beef patty came in an odd-looking shape, as if it was rolled into a square. What I loved most about the burger is its juiciness, although the burger bun wasn't really well-toasted and the lettuce looked like it was hastily chucked in. The cheese used was definitely processed cheese, losing some points for the freshness of their signature beef burger. While the appearance did not stimulate my appetite, it was a really huge portion for one. 12. It is founded by Chef Eddy and award-winning Chef Stephen. Both chefs have won accolades and cooked in hotels and other chain restaurants. Veteran chef Stephen Yong and chef Eddy Wan met at M.Y Golden Odyssey. With more than 10 years of culinary experience in various hotels and food establishments, the chefs now dish up modern-inspired Western cuisine that will surely surpass your expectations.